With Web Site Zapper, you compile a list of good and bad Web site titles and/or URLs (Web addresses). You can add Web site titles and URLs to these lists manually, or have Web Site Zapper build these lists automatically in learning mode (explained in the instruction manual). Titles and URLs on the lists can be very general. For example, you can block any site whose title contains "gambling" or "casino". You can allow any site whose title contains your company name. Likewise, URLs can be broad, such as allowing any URL that contains "google.com". This allows you to easily set broad parameters for good and bad sites if you like. If you prefer, you can make the good and bad site titles and URLs as specific as you like. Web Site Zapper is available as shareware ($25 individual fee, with volume discounts available). Try it for a month to see if you like it before you have to pay for it. Just download the install file to your computer, then run the file like a program by double-clicking on the install file in Windows Explorer or My Computer to install Web Site Zapper. Remember that complete instructions are provided for uninstalling Web Site Zapper if you decide that you do not like it. 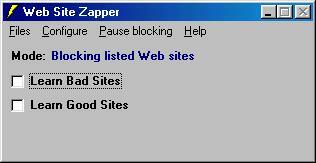 Web Site Zapper runs on Windows 95/98/2000/XP/ME (does not work on NT). Click here to download the installation program (wszarc.exe). Note: If you are interested in this program, you might also be interested in Program Sentry. Program Sentry allows you to control what programs can be run on your computer in a similar manner to the way Web Site Zapper allows you to control what Web sites can be accessed on your computer. To view information on Program Sentry, click here.